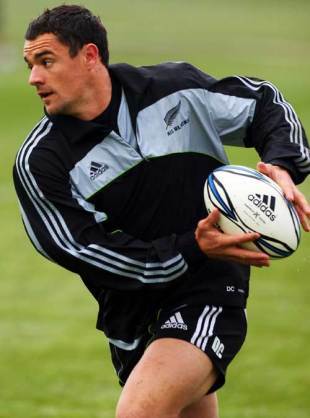 All Blacks coach Graham Henry has resisted the urge to shift star playmaker Dan Carter in to the centre - instead naming Waikato fly-half Stephen Donald in the No.12 jersey for Saturday's vital Tri-Nations meeting with South Africa in Hamilton. Donald will make his first start in the centre at any level for six years alongside Ma'a Nonu, who shifts to outside-centre, after injuries ruled Luke McAlister and Conrad Smith out of contention. There are no further changes to the starting XV after the All Blacks retained the Bledisloe Cup in Sydney last time out and Kieran Read has been cleared to start at No.8 despite struggling recently with a knee complaint. South Africa have made just one change to their starting line. Francois Steyn is recalled to the side at fullback in the place of Ruan Pienaar with coach Peter de Villiers resisting the urge to make wholesale changes following the Springboks' 21-6 humbling at the hands of Australia last weekend. Bryan Habana, who has been under an injury cloud with a hamstring strain, has been named on the wing, while No.8 Pierre Spies is nursing a groin problem. Despite the obvious issues with the scrum in Brisbane, the coach has opted to stick with his front row so captain John Smit remains at tight-head prop.